On the 30th of November, Chesapeake Earth First!, responding to a solidarity call from Idle No More, redecorated sidewalks and construction boards at the offices of Hill and Knowlton. Hill and Knowlton is the main DC area lobbyist for tar sands pipeline company Enbridge. Enbridge is infamous for trying to build tar sands pipelines over the objections of First Nations communities in Occupied Canada.Each of these is another Keystone XL, like the Keystone all of them cross Indigenous lands, and all of them must be and will be stopped. 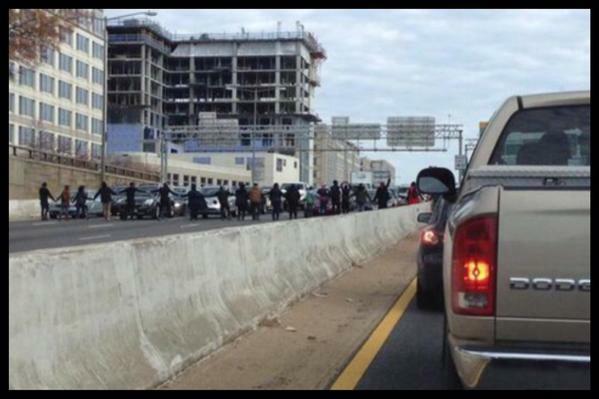 On the 30th of November, DC Ferguson protesters escalated their tactics with a hard blockade shutting down the SE-SW Freeway on one of the busiest travel days of the year. Eventually a sentence formed in my head that I thought got to the gist of things without risking my getting tackled by the Secret Service (I'm not as brave as the Code Pink women) and in a quiet moment while he was at the register summoned up as clear and loud a voice as I could to say "Hope you can close Guantanamo!" 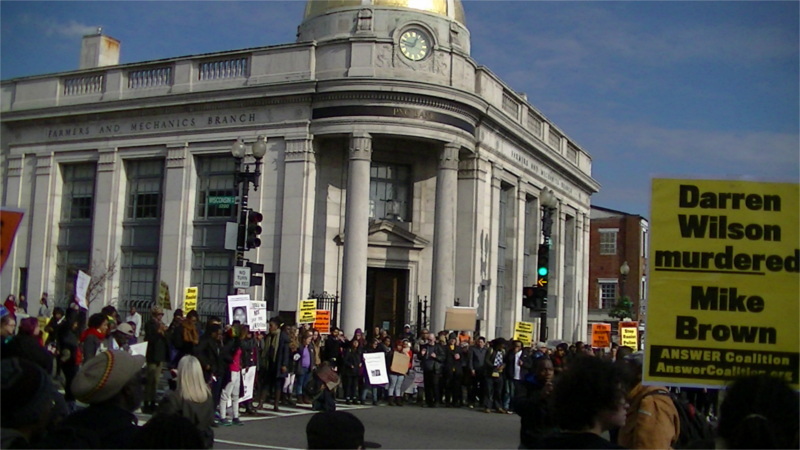 On the 29th of November, DC Ferguson protesters marched through Georgetown and shut down the streets. When the march headed out of Georgetown, marchers transitioned from the sidewalks to block shoppers who did not drive in from reaching the doors of upscale stores. At the end of the march, protesters surged into the Foggy Bottom Metro, got off at Pentagon City, and stormed into the shopping mall. Black Friday is also known as Fur Free Friday. 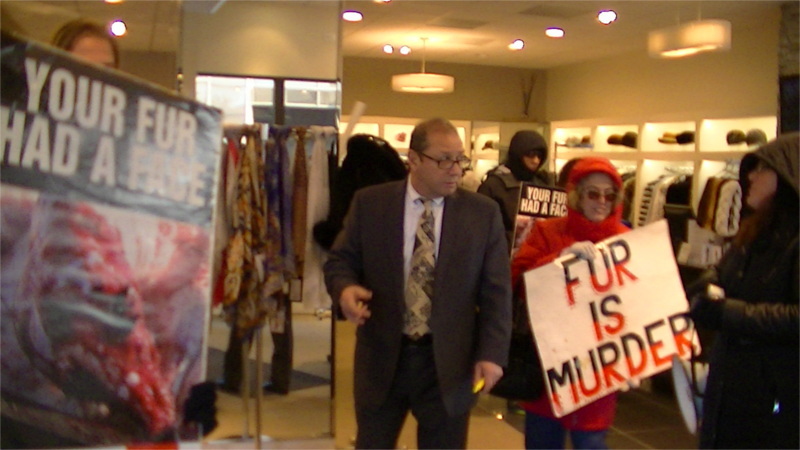 On Fur Free Friday, Nov 28, 2014, animal rights protesters marched around the fur shops around the DC-MD line, including Neiman-Marcus, Saks 5th Ave, Dior, and Bloomingdales. Afterwards everyone pretended to disperse, then some of them reassembled and stormed into Miller's Furs in Bethesda, MD. 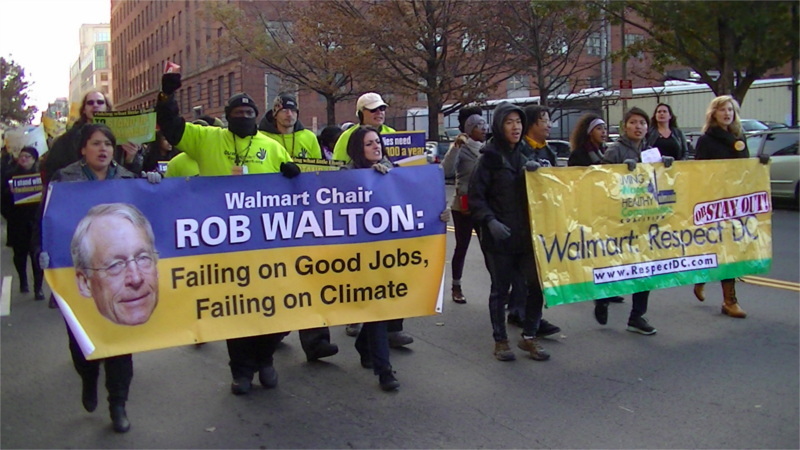 Video of march through "Furrier's Row"
On Black Friday, also known as Buy Nothing Day, labor protesters including striking Wal-Mart associates marched on the 1st and H st Wal-Mart in the third protest there this week. Some of the protesters managed to get inside first in a trickle, then a flood before police pushed them out. Several protesters were shoved by the same cop, and some were also threatened. The new Wal-Mart stores in DC chose to open on the settler holiday known as Thanksgiving, a day most workers get to spend with their families. 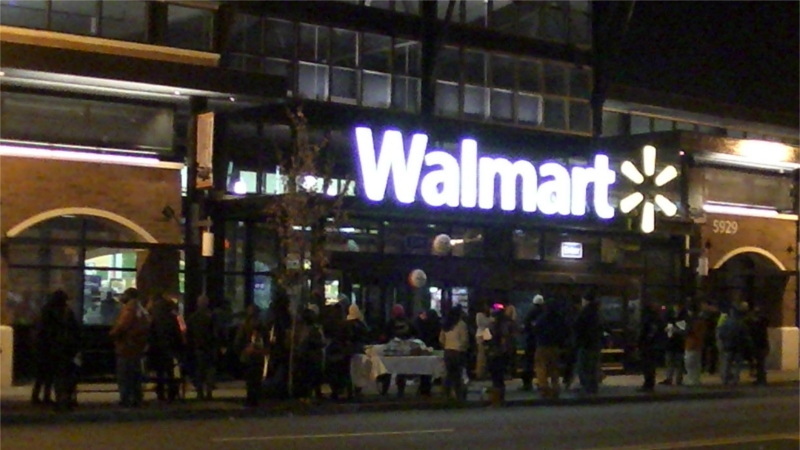 As they did, striking Wal-Mart associates backed by community activsts and supporters set up a mock dinner table outside the Ga Ave Wal-Mart to distribute cupcakes and fliers while they picketed. Police tried to intimidate them out of having a table on public space but Rev Hagler stood his ground and it was the police who backed away. 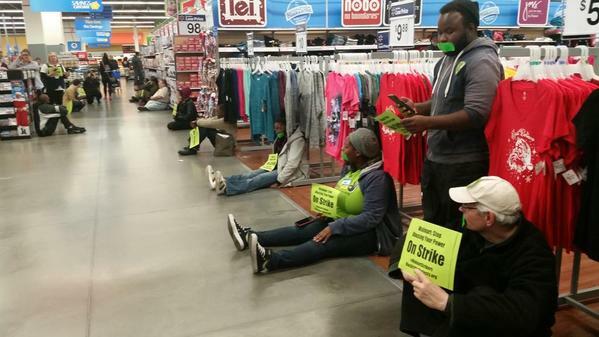 On the 26th of November, associates at the 1st and H st Wal-Mart went on strike, staging a sit-in in the aisles of the store with picket signs. The demand is simple: that management stop retaliating against workers who demand pay raises or better conditions. 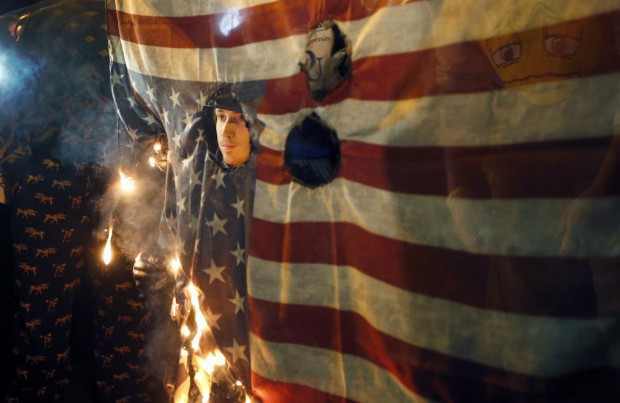 On the 25th of November, thousands took to the streets for the second night of DC Ferguson protests responding the the grand jury's refusal to indict killer cop Darren Wilson. The protest took over the streets and blocked the intersection of NY Ave and 395 before marching south-and storming the Wal-Mart on H st. The only looting was the usual looting by Wal-Mart's bosses, stealing from their associates with their law wages and terrible working conditions. Protesters made it plain they were after management, not the associates actually working late to put food on their family tables. 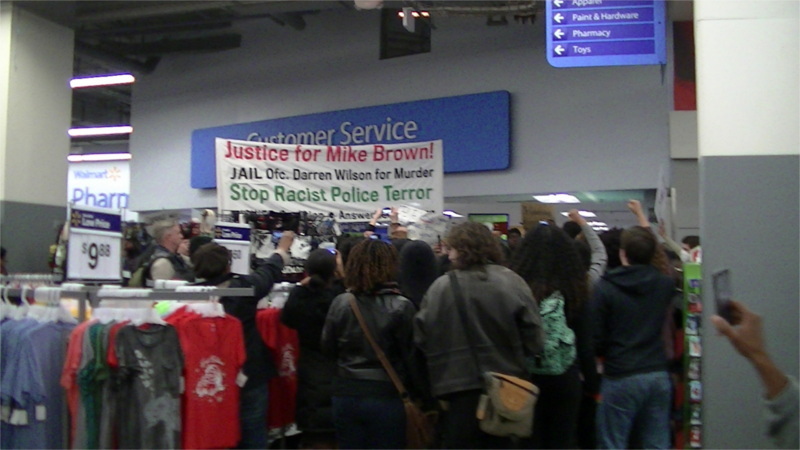 Wal-Mart is known to have donated $10,000 to killer cop Darren Wilson's legal defense fund, so on Nov 25 DC Ferguson marchers "indicted" Wal-Mart for obstructing justice by storming the H st store! On the 25th of November, with Ferguson protesters roaming the city, a wifi hotspot calling itself "Google Starbucks" appeared in the McPherson Square area. Upon connection I discovered it was replacing https certificates for this website and several others with invalid ones. Another connecton did not generate this warning, proving "Google Starbucks" to be intercepting web traffic.